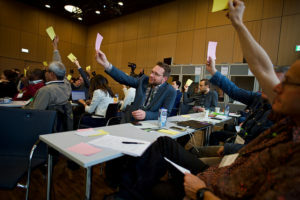 At the recent Global Landscapes Forum (GLF) in Germany, FTA, IUFRO and the Swedish International Agricultural Network Initiative (SIANI) organized a Discussion Forum titled Rainfall Recycling as a Landscape Function: Connecting SDGs 6, 13 and 15. The discussion aimed to shed new light on the role of forests and trees in the climate debate, building on a scientific review paper about the relationship between forests and water titled Trees, forests and water: Cool insights for a hot world, and an online symposium organized by FTA in May 2017. It also discussed preliminary highlights of IUFRO’s current Global Forest Expert Panel (GFEP) on Forests and Water, which is expected to issue a policy relevant global assessment report in July 2018. At the GLF, participants discussed how these research findings should be reflected in policy making. “We are going to discuss something that might have the potential to change the narrative […] about forests and trees in landscapes in relation to climate change, land management and other issues,” IUFRO Executive Director Alexander Buck said in opening the session. “In many parts of the world, local people, if you ask them, are convinced that forests and trees not only depend on rainfall, but they also play a critical role in actually generating it,” Buck added. “Experts will also present some emerging highlights from a global scientific assessment looking at the interactions between forests and water,” Buck added, referring to the GFEP, which is coordinated by IUFRO. The first section of the discussion, looking at scientific insights, was moderated by GFEP cochair Meine van Noordwijk, the lead author of Ecological rainfall infrastructure: investment in trees for sustainable development, who is also known for his work within FTA. David Ellison, the lead author of the review article Trees, forests and water: cool insights for a hot world, spoke first on the concept of hydrological space. He addressed how water is transported across land, describing continental evapotranspiration as feeding an important share of terrestrial precipitation. Thus, increasing forest cover can lead to increased precipitation and runoff, and spatial organization also matters. Describing water in the Blue Nile Basin, of which a large share originates in the West African rainforest, he explained why land use, forests and the large-scale water cycle are so important when it comes to rainfall. Aster Gebrekirstos of the World Agroforestry Centre (ICRAF) then discussed tools and equipment that can be used to show how trees play a role in the water cycle. By measuring isotopes in tree rings it is possible to understand how fast trees have grown in the past, and where the rain absorbed by trees comes from, Gebrekirstos explained. 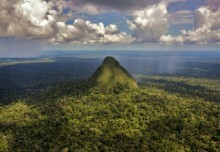 The Amazon was shown to be generating its own rainy season, while in Bolivia more than 50 percent of rain comes from evapotranspiration. Aida Bargues-Tobella of the Swedish University of Agricultural Sciences, coauthor of Intermediate tree cover can maximize groundwater recharge in the seasonally dry tropics, discussed how, as an alternative to a prevailing paradigm, more trees can improve (and not diminish) groundwater recharge in seasonally dry areas. Although there are tradeoffs in planting trees in dry areas, Bargues-Tobella showed how new theories enable the determination of an optimum level for tree cover with respect to groundwater recharge, as evidenced in Burkina Faso. The discussion then progressed to implications that this new science might have for climate, land, water and related policies and actions, in a second part moderated by Paola Ovando Pol of Eawag, the Swiss Federal Institute of Aquatic Science and Technology, who is also a member of the GFEP on Forests and Water. Greenhouse gases come from the use of fossil fuel, and also deforestation, he explained. There is an elaborate framework on how climate change, because of increased greenhouse gases, leads to changes in ocean temperatures, which in turn leads to changes in how much moisture is around, leading to changes in rainfall, he suggested. 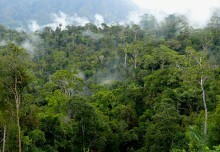 Van Noordwijk then explained that forests and trees outside forests also influence rainfall through several feedback loops, from local to continental levels, as evidenced in Latin America, the African continent and Southeast Asia. With this new knowledge, the relation between climate, forests, water and people looks different, he said. It is not captured in current policy frameworks, but has important consequences. 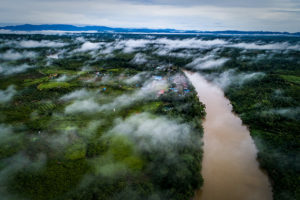 Daniel Murdiyarso, principal scientist at the Center for International Forestry Research (CIFOR), posed the question of what forests can do for water and climate. They can promote rain, transfer vapor, recharge groundwater, moderate flooding and cool air, he suggested. The world needs a new way of governing forests, he said, citing watershed approaches, links to climate objectives such as REDD+, Nationally Determined Contributions (NDCs), and National Adaptation Plans (NAPs), as well as sustainable forest management. Rounding out the second part, senior researcher Holger Hoff of the Potsdam Institute for Climate Impact Research and Stockholm Environment Institute (SEI) said the link to policies was the new aspect of the work. He covered how to add to existing frameworks, targeting methods to audiences, triggering action, identifying win-wins and increasing complexity. 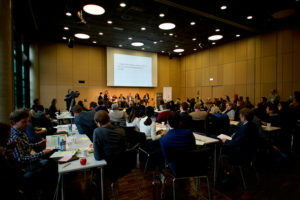 Finally, in the third and final part of the discussion, FTA Director Vincent Gitz asked the audience “who can do what” with this knowledge, in terms of optimizing the contribution of forests and trees to the regulation of the water cycle, increasing resilience and therefore providing ways for landscapes – and the people in them – to adapt to climate change. In a lively audience discussion, various points were raised about the respective roles of different actors. Science and research have a special responsibility in terms of being clear about domains of uncertainty, especially when quantification of effects is concerned. Research has a role in clearly explaining science, as well as its limits, to policymakers. Science also needs to be clear about knowledge gaps. These include, for instance, whether there are different effects for different tree species (especially indigenous species), and about the range of scale of these effects. “It is all about better understanding these ecosystem services, giving them proper value, finding ways to account for them in current incentives and regulation schemes, and creating spaces for them in policy debates,” Gitz said following the forum. The next step for this science-policy interaction will be the release of IUFRO’s GFEP report on forests and water in July, and upcoming discussions about the Sustainable Development Goals in New York. By Vincent Gitz, Director of the CGIAR Research Program on Forests, Trees and Agroforestry (FTA), and Alexander Buck, Executive Director of the International Union of Forest Research Organizations (IUFRO). 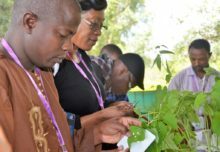 This work forms part of the CGIAR Research Program on Forests, Trees and Agroforestry, which is supported by CGIAR Fund Donors.